There was a rehearsal arranged for the Thursday before the big day at The Albion Church in Ashton-U-Lyne. This is where I met all the bridesmaids, groomsmen & Alan, the vicar. 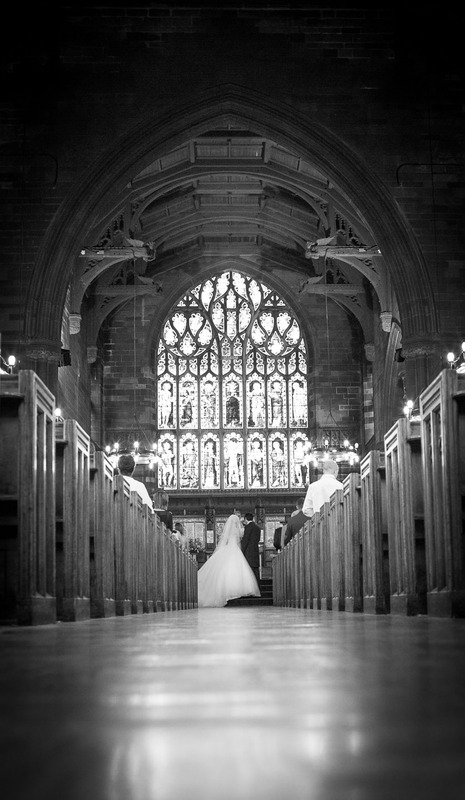 The inside of the church was a sight to be hold, beautiful stained glass windows, deep red brickwork, brand new lighting & all in such a vast space which made it even more spectacular. I couldn’t wait to shoot this wedding. The big day arrived & I headed off to the couples house to where Amber was doing all the stereotypical bridal preparation, or so I thought, nope, she was actually putting final touches to the venue which was the San Rocco in Ashton-U-Lyne & all this was just after leaving the hairdressers. Amber had dressed all the room herself even though this was her first ever wedding, even as a guest, so was doing it all from her own ideas & not following anyone else’s thoughts. I started taking some photos anyway of the bridesmaids having make up done, a few glasses of wine between them & all getting excited for the day ahead. Amber arrived looking cool calm & collected, although she has later told me she was slightly flustered that day, So I just carried on as normal moving round the room getting all the early pictures of the day that some people forget about. I got some great photos of the dress & shoes upstairs, resting on a mannequin all ready to be worn. She came down dressed to a more than nervous dad waiting patiently to see his daughter in her dress for the first time. His face said it all….Proud. Amber looked amazing & was doing amazing to stay calm & collected & not shed a tear, as was Andy too. The car arrived, the girls all filed out into transport to the church & not too far behind was Ray, the driver of a vintage Rolls Royce, the car for the day. Everyone headed to the church to the awaiting family & friends & I got there just in time to get myself adjusted & take some photos of people waiting & also of the beautiful church. She’s here, I heard, everyone settled down to see the beautiful bride walk down the long aisle to Dave, waiting at the altar to marry his best friend, his soul mate & companion. As soon as she arrived at the altar, Dave’s face lit up. The look on both their faces convinced me I was in for a great day, there was an automatic look that every photographer knows when a couple are genuinely in love, this in turn makes our job a whole lot easier, no forced smiles, not having to tell them to kiss or hold one another, these two were in love. The service was excellent & the poem that Ambers brother, Lachlan chose, was meaningful & made more than a few listen, it was Ghazal by Mimi Khalvati, truly awesome words. The register was signed & the new Mr & Mrs Chetcuti stepped out into the church to meet all the family & friends as newlyweds. The cameras were poised to get that photo of the happy couple as they walked down the aisle, they were smiling from ear to ear en route to the entrance of the church. The early afternoon sun shone through the stained glass windows to light their way as all the guests & family followed them out. Outside was the chance for all to take the photos, hug & kiss the bride & groom & maybe even loosen a tie or two. We prepped all the stereotypical photos with a slight edge to them, not so formal but definitely plenty of smiles on faces. We organised the confetti throwers into position & Amber & Dave walked through what seemed like a snow storm of confetti flanked either side by everyone cheering them by. Off to the venue for a few glasses of champagne & for even more hugs, kisses & photos. The room was decorated with all Ambers hard work & ideas, it looked professional. Now was the time for Amber & Dave to chill & relax & finally chat to everyone as I floated around capturing photos of them both enjoying their special day with family & friends. The meal was served so I retreated to somewhere I could rest to recharge the batteries for the second half of the day. The time had come for the speeches & Ambers dad, Andy, went first. Seeing as both Andy & Amber both work together too, you could see the laughs were already appearing before Andy had said a word. Dave’s turn next, mainly focussing his words towards his love for Amber, he had some of us with a lump in our throats. Then it was the turn of the best man, Steve, he opened with a few stereotypical best man jokes to calm himself down & was soon in full flow chatting & telling tales of he & Dave growing up together. There was laughter galore during his speech & raised a glass to finish off in a toast…to The new Mr & Mrs Chetcuti. The evening guests were arriving quickly & the evening sun shone through the large windows lighting up the entire room, which in turn laid the best lighting down for some creative photography. I called Amber & Dave over for some portrait style photos & used the light to silhouette them both for some really punchy photos which will look amazing in print. Time for the cake to be cut & some more photo opportunities for myself & all who wanted them. It wouldn’t be a wedding if the bouquet was thrown, so off outside we went & I think it was Ambers Aunty that caught it. It was nearly time for the first dance, Nothing else matters by Metallica.. all 7 minutes of it but they cut it short so they could start the Karaoke sooner. It was then Ambers turn to have the Dad & Daughter dance which was.. Butterfly fly away, by Miley Cyrus & Billy Ray Cyrus. By this time, the dance floor started to fill up led by Davids dad, Simon & all the family. My work was nearly done, it was an absolute pleasure being part of their big day & grateful they put all their trust in me & I personally had a blast with some great people & couldn’t wait to get starting in the editing suite & deliver the photos to the new Mr & Mrs Chetcuti. I couldn’t of asked for a better person to take the pics on mine and David’s wedding day! The pictures are beautiful, couldn’t of asked for better! Lee really went the extra mile to get the pictures he wanted, all out guests loved him! He felt like part of our party! Honestly amazing! Hiya, not sure whether or not you got my reply as I have been having some technical problems with my website, I’m sure I sent you an email as well, but if I didn’t I must apologise. My number is 07977 517 404, if you give me a quick bell I shall call you back no problem..